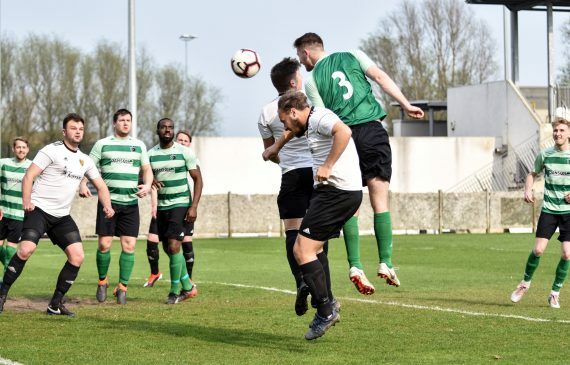 The push for promotion from SCEFL Division One took an interesting turn as 1st v 4th ended with a 0-0 draw, whilst results elsewhere tightened things up ahead of the key last month of April. 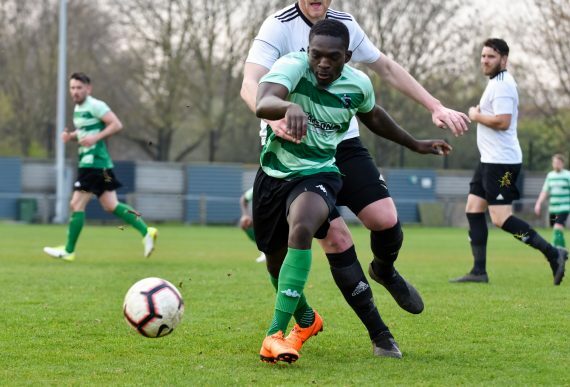 Kennington arrived at Bayliss Avenue in fine form, and were the better side for the opening quarter of an hour without a clear chance, before a foul on Kennington forward Gary Lockyer gave him a free-kick situation 20 yards out which he fired just over on 15 minutes. Lockyer again was the threat two minutes later as a Tom Scorer right sided cross gave him an opportunity to head at goal, but back-peddling and stretching he headed high and wide. Slow out of the blocks, a promising Welling attack was broken down, and Kennington countered and a long ball found that man again and Lockyer fired wide. Welling’s first chance of the game came after a Sam Bailey attack on the left found his shot blocked, only for it to fall to him again, and a right footed cross was headed clear to full-back Jamie Taylor who shot high and wide on the volley. With no chance for a while, only moments later Bailey crossed again and a rebound dropped between Golding and Gamble for both to attack and sadly a combination of hesitation and bad luck meant nothing came of a good half chance. On the front foot, Welling were on the attack on 48 minutes, with Harvey Brand playing high down the left hand side and when in behind the agony of shot or cross sadly meant a well saved effort when attacking players were screaming for a cut-back. The resulting corner was pulled back was pulled back for an off-side making Brand’s decision an irrelevance due to off-side. Moments after, the same combination on the left meant a Brand pass put Jordan Samuel in and his shot was blocked and a second attempt was too leading to another corner. Sam Conlon on the attack from Kennington was on the attack on the left, cutting back on to his right foot, and it was only a nick off of his toe from Harry Gamble to stop him putting Kennington ahead. Knowing a win would remove Kennington from the title race, Welling pushed on and Adjei replaced Grant Brown just before a Golding shot was well saved, and a Marlon Patterson pass played top scorer Golding in again for his second shot in as many minutes, for a back post effort to be tapped home by Gamble only for the off-side flag to be raised against Golding. Threatening Tom Scorer was removed by his Kennington manager brother Dan on 77 minutes due to injury, before Daryl Dylan entered the field for Sam Bailey with ten to go. With 6 minutes to go a Jordan Samuel attack on the right hand side got him in behind and when a cross on the deck would have given an easy tap in, a chipped cross evaded attackers and defenders and went out of the back of the penalty area. 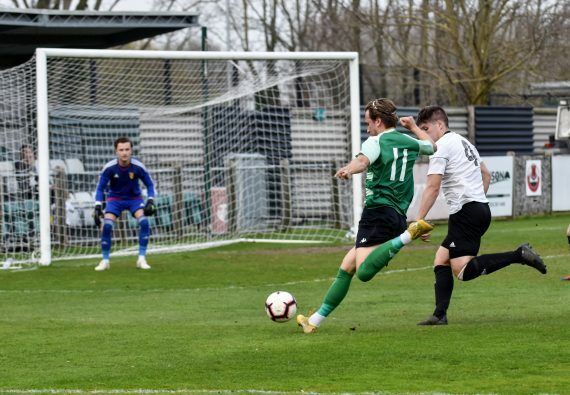 Deep in to injury time, an attack on the Kennington left put their left back in on goal when an off-side flag should surely have been risen, and the afternoon was summed up well as the shot was drilled side before the referee blew for full-time. With just four games to go, and the top four separated by a handful of points, the top four could yet finish in any order. Welling Town – Moore, Taylor, Brand, Patterson, Wells, Mensah, Samuel, Gamble, Golding, Brown (66’ Adjei), Bailey (80’ Dylan). 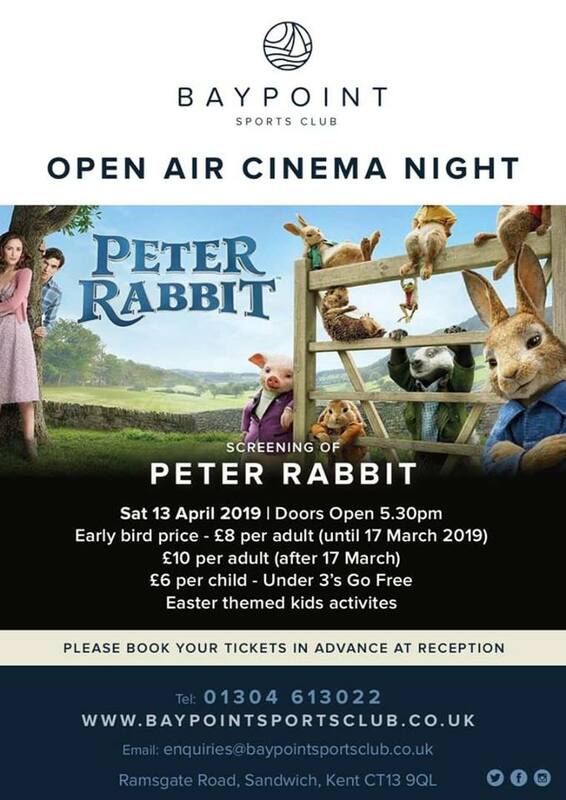 This entry was posted	on Saturday, March 30th, 2019 at 4:52 pm	and is filed under Football, Non-League Football. You can follow any responses to this entry through the RSS 2.0 feed. Both comments and pings are currently closed.